It was our second trip to Insadong in less than a week. Danielle noticed a little stand that specialized in carving personalized “stamps” (dojang or name chop) into small stone blocks. After looking into it and deciding that the stand’s offerings were a bit tacky, we made off, ready to wander into another shop. It just so happened that one of the nearby stores also offered personalized dojang engravings. However, their collection of stones, as well as the atmosphere, was far superior. Danielle decided, almost right away, to get a personalized dojang. She picked a stone, wrote her desired text: “wake up and dance” on a piece of paper, and the process began. 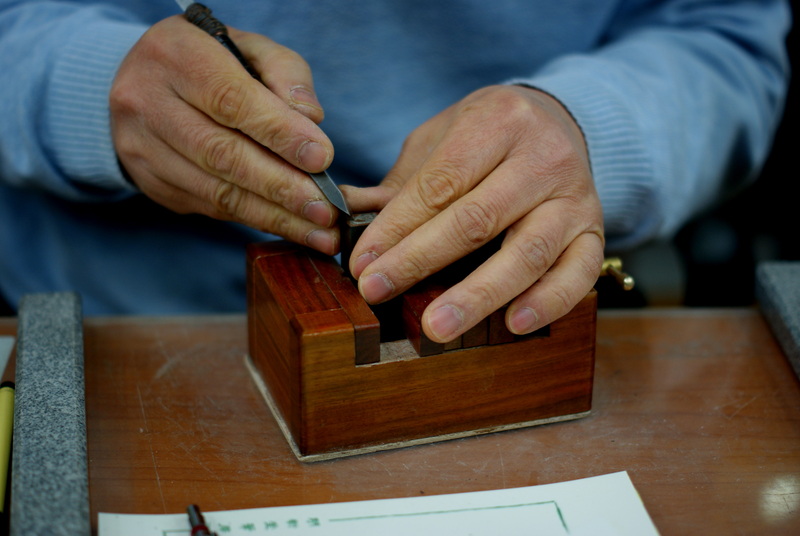 Although it may sound simple, carving these stamps requires lots of talent, not to mention a steady hand and a keen eye. The base of the stone is sanded a bit to smooth out any imperfections. Next, a “stencil” is painted on the base. The stone is then placed in a vice, and the carving begins. You can select one of two styles. Danielle chose the option where the letters or design on your stamp are carved into the base. After watching the process and seeing the outcome of Danielle’s dojang, I had no choice but to get one. It was just too cool. With the other style, (the one I chose) the carver carves around your lettering or design. The choice has to do with negative vs. positive space. Danielle’s leaves the lettering white as it doesn’t make contact with ink. My lettering (my initials) is colored, while the background remains white. Danielle and I are both really happy with our decisions to have these made. They’re cool souvenirs, and ones were likely to use for a long time. 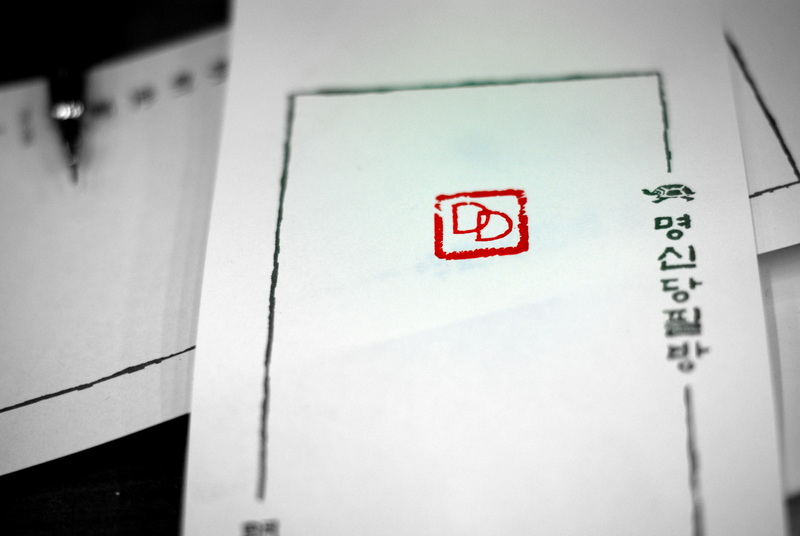 The stamps come with presonalized ceritificates, stamped with a rabbit (it is currently the year of the rabbit). We also got some red ink and boxes to store our new “name chops”. In the picture above, one of the shop’s talented carvers works on my dojang. If you want to see how my dojang turned out, check back in the next couple of days for dojang (part 2).